Once Upon a Time in a Different World, a unique addition to the celebrated Children’s Literature and Culture series, seeks to move discussions and treatments of ideas in African America Children’s literature from the margins to the forefront of literary discourse. Looking at a variety of topics, including the moralities of heterosexism, the veneration of literacy, and the "politics of hair," Neal A. Lester provides a scholarly and accessible compilation of essays that will serve as an invaluable resource for parents, students, and educators. 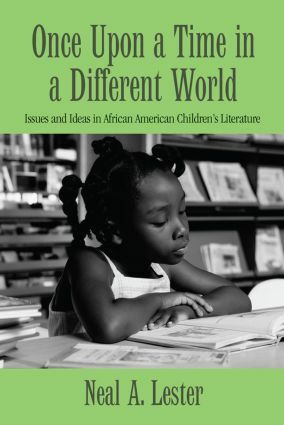 The much-needed reexamination of African American children’s texts follows an engaging call-and-response format, allowing for a lively and illuminating discussion between its primary author and a diverse group of contributors; including educators, scholars, students, parents, and critics. In addition to these distinct dialogues, the book features an enlightening generational conversation between Lester and his teenage daughter as they review the same novels. With critical assessments of Toni and Slade Morrison’s The Big Box and The Book of Mean People, bell hooks’ Happy to Be Nappy, and Anne Schraff’s Until We Meet Again, among many other works, these provocative and fresh essays yield a wealth of perspectives on the intersections of identity formations in childhood and adulthood. RESPONSE TO “DIALOGUING REVIEWS”: Parents, It’s 10:00—Do you Know What Your Children are Reading?